Everyone has dreamt about having a bespoke dressing room at their place at least once in their lives. For people who love fashion and clothing, it is the ultimate dream and for the people who are crazy about organizing things efficiently yet aesthetically, it is something to literally drool over. Designer wardrobe are loved by people all over the world because not only are they fit for purpose but also add a touch of elegance to your home. All your stuff is within reach and sight. Storage space is carved to fit your needs and style. They are often a value adding factor to your house. Modern walk-in closet are viewed as a luxury. Custom made wardrobe can also provide you with a great morning feel when you are getting dressed for the day. Bespoke storage solutions are great for fashionistas or people who have collections of shoes or bags. All the stuff can be displayed to remain within eyesight and reach yet hidden from the dust at the same time. The space for the fitted wardrobe can be found almost everywhere. You just need to be creative and thoughtful enough to be able to see how the space available can be turned into your own fitted wardrobe made-to-measure. Customised closets are great because they are built not only keeping your storage needs in view but also the availability and efficient use of space. Do you have the space under the stairs? Is there a loft room in your home? How about the utility room that you do not use often? For the larger spaces the bespoke dressing room might be a great option. If you are some who loves shoes, you can go for a fitted shoe storage in your custom closet. Fitted shoe storage can be built within a walk-in closet along with shelves, drawers and hanging space for your maxi dresses, coats and suits. Painted walk-in closets and modern dressing rooms can provide a cosy feel in addition to the effective storage. The possibilities are endless when it comes to customization. You can go for pull-down hanging rails for longer items and for the room with the high ceiling, fitted LED lighting, accessory drawers, shoe drawers etc. You can also install switches and mirrors inside the walk-in closet so when you get up in the morning and want to get ready you can find everything in there. You can get dressed and have all your styling equipment like hair dryers, curlers, straighteners, etc. in one place too. 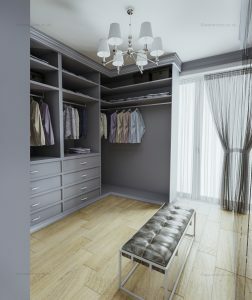 So, the walk-in closet can become your ultimate dressing room where you decide what and where exactly will be kept.